Teaching this class was a pleasure, and I am especially happy about how awesome the class projects turned out. 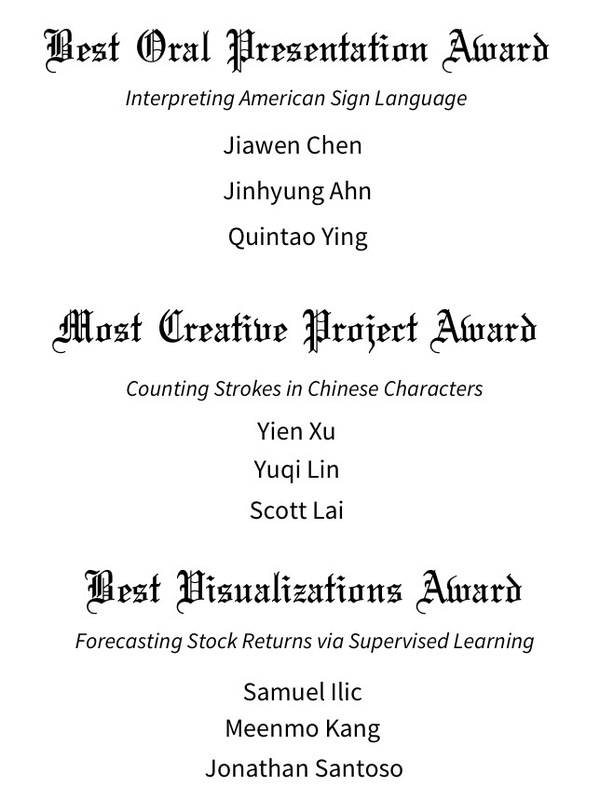 Listed below are the winners of the three award categories as determined by ~210 votes. Congratulations! This course will cover the key concepts of machine learning, including classification, regression analysis, clustering, and dimensionality reduction. Students will learn about the fundamental mathematical concepts underlying machine learning algorithms, but this course will equally focus on the practical use of machine learning algorithms using open source libraries from the Python programming ecosystem. Students are expected to participate in an individual, final class project (the topic can be flexibly chosen by the students within the scope of the material taught in this class) and apply the learned concepts to real-world problem-solving. Along with introducing of the concepts of machine learning, the lectures will provide a refresher on relevant concepts from calculus and linear algebra – a calculus background (e.g., Math 221) and a linear algebra background (e.g., Math 340) is recommended. While this course will also provide an introduction to the basics of the Python programming language for machine learning, it is highly recommended that students are familiar with basic programming and have completed an introductory programming class. Understanding the different fields of machine learning, such as supervised and unsupervised learning, and identifying scenarios where it makes sense to apply machine learning for real-world problem-solving. Building a repertoire of different algorithms and approaches to machine learning (data and algorithmic models / parametric and nonparametric models) and understanding their various strengths and weaknesses. Being able to think about approaching problems with the desired outcome in mind, to navigate the typical trade-off between computational efficiency, model interpretability, and predictive accuracy effectively. Combining both the theoretical and practical concepts taught in this class to creative, real-world problem solving and having completed a project that can be optionally shared on a resume. Course Prerequisites: Consent of instructor. Course Audience: Students majoring in math or statistics or those wishing to take additional statistics courses. Many of the hands-on code examples, topics, and figures discussed in class were adopted from this book; hence, it is highly recommended to read through the chapters in this book. Code examples and figures are freely available online under an open source license at https://github.com/rasbt/python-machine-learning-book-2nd-edition. Throughout this course, several chapters will be recommended as further reading material for interested students. Since this book covers more advanced material that is more appropriate for a graduate-level course, material from this book will be recommended, not required. A free PDF version of this book is avalailable at https://web.stanford.edu/~hastie/ElemStatLearn/. “Illustrated Guide to Python 3: A Complete Walkthrough of Beginning Python with Unique Illustrations Showing how Python Really Works. Now covering Python 3.6 (Treading on Python) (Volume 1)” by Matt Harrison, ISBN-13: 978-1977921758. This book will not be coverered in class. However, some readers asked me for good Python resources as preparation for this class, and this is one of the resources I would recommend. However, there are many other Python learning resources available online. For instance, another great book is Allen Downey’s Think Python 2e (free PDF available at https://greenteapress.com/wp/think-python-2e/). Depending on your preferred learning style, also consider learning Python interactively instead/or in addition of reading a Python book. A great interactive resource for learning Python is Codecademy: https://www.codecademy.com. In particular, there is a free, < 10 hr interactive course: https://www.codecademy.com/learn/learn-python. The goal of working on a class project is three-fold. First, it will provide you with the opportunity to apply the concepts learned in this class creatively, which helps you with understanding material more deeply. Second, designing and working on a unique project in a team which is something that you will encounter, if you haven’t already, rather sooner than later in life, and this course project helps with preparing for that. Third, along with the opportunity to practice and the satisfaction of working creatively, students can use this project to enhance their portfolio or resume. There is no “perfect project.” While you are encouraged to be ambitious, the most important aspect of this project is your learning experience. Hence, you don’t want to pick something that is too easy for you, but similarly, you don’t want to choose a project where you are not certain that is out of the scope of this class. The project proposal is not graded by how exciting your project is but based on whether you follow the objectives of the project proposal, project presentation, and project report. For instance, if your project ends up being unsuccessful – for example, if you choose to design a classifier and it doesn’t achieve the desired accuracy – it will not negatively affect your grade as long as you are honest, describe the potential issues well, and suggest improvements or further experiments. Again, the objective of this project is to provide you with hands-on practice and an opportunity to learn. The project consists of 3 parts: a project proposal, a short project presentation, and a project report. The expectations for each part will be discussed in the following sections. The main purpose of the project proposal is to receive feedback from the TAs/the instructor regarding whether your project is feasible and whether it is within the scope of this class. Also, the project proposal offers a chance to receive useful feedback and suggestions on your project. For this project, you will be working in a team consisting of three students. The members of each team will be randomly assigned by the TAs/instructor. If you have any concerns working with someone in your group, please talk to a TA or the instructor for accommodations. The project proposal is a 1-3 page document (800-1200 words) excluding references. You are encouraged (not required) to use 1-2 figures to illustrate technical concepts. Describe what you are planning to do. Briefly describe related work (if applicable). Describe why your project is interesting. E.g., you can describe why your project could have a broader societal impact. Or, you may describe the motivation from a personal learning perspective. How do you measure success, specific to this project, from a technical standpoint? What resources are you going to use (datasets, computer hardware, computational tools, etc.)? Clearly indicate what computational and writing task each member of your group will be participating in. It is crucial that you talk to each other regularly!!! Schedule regular meetings and/or use online communication tools (e.g., Gitter, Slack, or email) to stay in touch with your group members throughout the semester regarding the process of your project. Modifications to the Proposal. After you have received feedback from the TAs/the instructor and your project proposal has been graded, you are advised to stick to the project outline in the proposal as closely as possible. However, if there is a concept introduced in a later lecture (for instance, a machine learning algorithm that you think is more appropriate then the one you proposed), you have the option to modify your proposal, but you are not penalized if you don’t. If you wish to update your project outline, talk to a TA first. highlight the outcomes of your project. The presentation should be 8-10 minutes long, plus 2 minutes will be reserved for questions. All members of the group should participate in the presentation. To encourage attendance, we will use a random number generator in class to determine the order in which the groups will present. Please bring your own device for the presentation (we have a VGA and a HDMI cable for this projector). Further, I will provide the following connectors: Displayport-to-HDMI, Displayport-to-VGA, USB-C-to-VGA, USB-C-to-HDMI, Lightning-to-HDMI (for iPad). The awards will be determined by voting, each student will fill out a card in class (I will provide the cards), voting for each presentation (on a scale from 1-10 for each of the 3 categories, where 10 is best), and I will collect the cards at the end of the lecture. The awards will be computed based on the highest number of points for each category. However, one project can only receive one of the prizes. Each of the three cards handed in will provide 3 bonus points towards your project report grade (9 pts in total). More details are provided in the LaTeX report template at https://github.com/rasbt/stat479-machine-learning-fs18. Also, you are required to submit all the code, computations, and experiments you developed and conducted for this project. Note that the quality of code will not have any influence on your grad and will merely serve as a basis to establish that the report contains original and “real” results. You are encouraged to share your project/final project report online after you completed the course – for example, via GitHub or on a personal website online. Besides, I would be happy to write a blog article summarizing each project in a few sentences, including a link to your project website (if applicable). However, note that your project will only be included with your explicit consent, and if you don’t want to share your project online, that’s totally fine. Note that this is a tentative schedule subject to changes. Below is a list of topics we aim to cover. However, we will take our time, and it is more important to build a good understanding of the core concepts and the field in general rather than covering one more algorithm. Keep in mind that a good foundation will enable you to study and understand additional algorithms if the need arises. Lecture 1: What is Machine Learning? An Overview. The following topics will be covered in the beginning of the Deep Learning class next Spring.